If you are looking for a companion, a mixed-breed dog is one of the best you will ever find. These dogs come with incredibly unique and diverse personalities, and they often have an interesting mixture of traits to match. Most importantly, mixed breed dogs are much more commonly found in pet shelters, meaning that adopting a loveable mutt could literally save a dog’s life. So, rather than considering a purebred dog from a breeder, bring home a new family member who truly needs your love. 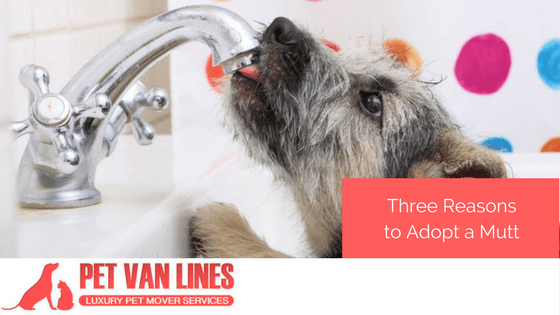 Whether you stay in one place or use pet moving services to relocate after a few years, you and your mutt can enjoy a long, fulfilling life together. If you are still on the fence, consider the following reasons why adopting a mutt can bring both you and your new pet joy. Breeding standards mean that purebred lines are purposefully maintained to minimize the occurrence of non-standard traits. Unique purebred dogs are often isolated from the line and prevented from creating an offshoot with “undesirable” physical traits. While some people may want a dog that is audited for X, Y and Z traits to ensure it is exactly like all the others, many people want a more special dog that they could not find anywhere else. Mutts can be this special dog. No two are alike. Even within litters, some pups can look dramatically different from their siblings and have different ways of expressing their genes. Small dogs crossbred with medium dogs may have different-sized pups, for instance. Also, while purebred dogs may have their own well-loved set of traits, mixed breeds often find adorable and endearing ways to combine them into irresistible hybrids. No matter what kind of mixture you end up with, your mutt is guaranteed to be one of a kind with endearing physical attributes and a unique personality that could never be replaced. Around 6.5 million animals enter animal shelters throughout the U.S. every year, according to the ASPCA. 1.5 million animals will be euthanized every year, but this number has gone down by over a million since 2011. Why? Part of the reason lies in better systems for returning lost pets, but eager adopters can also take a large portion of the credit. The thing is: dogs have no problems breeding on their own. Owners who don’t have either the education or the will to sterilize their dogs contribute to millions of unwanted puppies born every year, many of whom will become strays or end up in shelters. Dog lovers should want to reduce the number of euthanized animals and the suffering of abandoned animals forced to live meager lives on the streets. Adopting a purebred animal not only takes away from a possible home for these animals, it also encourages breeders to needlessly produce more dogs when we have plenty already! Unless you plan on showing a dog or using it for specific work practices, a mixed breed will provide all of the utility you need while saving an animal’s life. Mixed-breed dogs tend to have a healthier genetic profile compared to their purebred cousins. They have a reduced risk for 10 debilitating genetic conditions, including aortic stenosis, a heart condition that can reduce an animal’s lifespan as well as overall quality of life. Some biologists and veterinarians also suspect that cross-bred dogs may have hardier health overall because of a theory called “hybrid vigor,” although the actual scientific evidence is limited because of a lack of comprehensive studies. We hope we have inspired you to go out and bring a mixed breed dog home to become your new family member. If you plan on moving soon, you can also take advantage of our pet relocation services that can bring your furry friend anywhere they need to be across the country on your schedule. The pets also enjoy a much less stressful journey! Take a look at our happy, furry customers on their way across the country to see how much more carefree your move can be, and then request a free quote today!